Grant Recipient: River Bend Nature Center, Inc.
RiverBend Nature Center ($6,075)Since 2009, the RiverBend Nature Center’s WATERshed project has been educating children on the importance of safeguarding water resources—especially those resources on the Root River and in Lake Michigan. 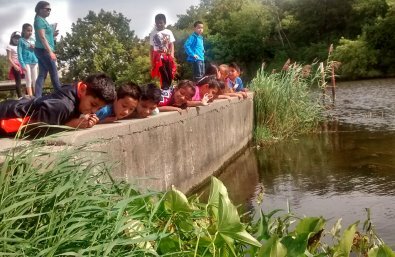 This award supports this program and the students in 4th and 7th grade who learn about stormwater discharge, wetlands and buffer zones, and water quality testing. These students also perform water quality tests, survey various species, and conduct cleanups at local beaches. Not only is this program a popular component of the Riverbend Nature Center’s mission, but it is also a priority in the Root River Restoration Plan.